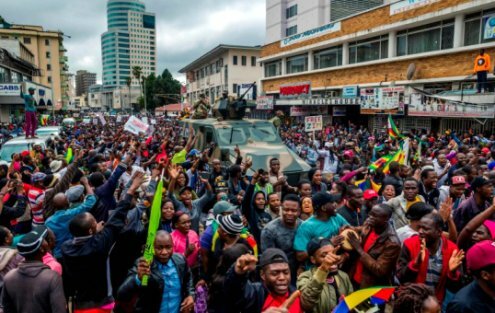 Zimbabwe, a landlocked Southern African country, woke up to find out a quiet revolution had taken place one morning in November. 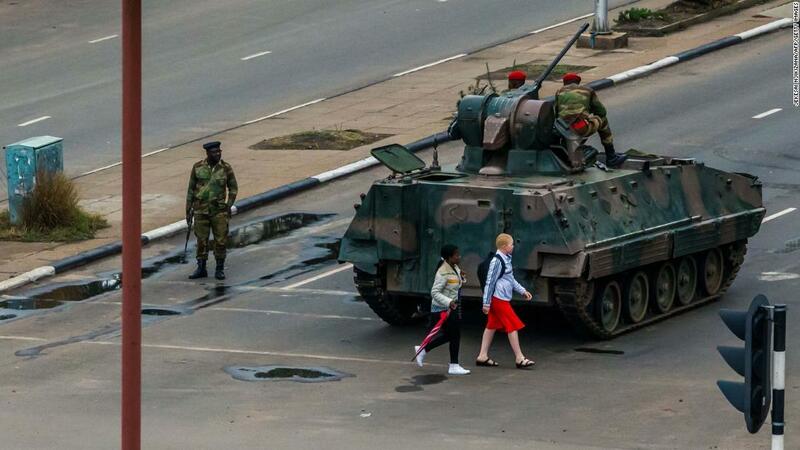 Tanks patrolled the streets as the nation waited with bated breath and folded arms to see what would emerge. Ten days and a peaceful march later, a new president was inaugurated and the country waits to see (again, with bated breath and folded arms) what will transpire... and whether lives will be transformed and everything will be different. Art can be a very powerful tool, often used to reflect and externalize the states of mind of societies, countries and indeed, continents. This is especially so when freedom of thought has been quelled and expression in any form has been quashed. Sometimes, people are even brutalized for daring to say what they think. Very significantly, artist Kudzanai Chiurai has returned to Zimbabwe to hold a solo exhibition at the National Gallery of Zimbabwe in the capital, Harare. It’s very aptly named “We need New Names”. 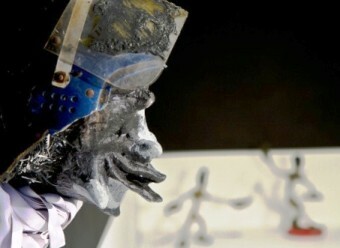 In New York at Catinca Tabacaru Gallery, Zimbabwean sculptor Terrence Musekiwa is holding an exhibition called “Standing on a line and not being on either side”. 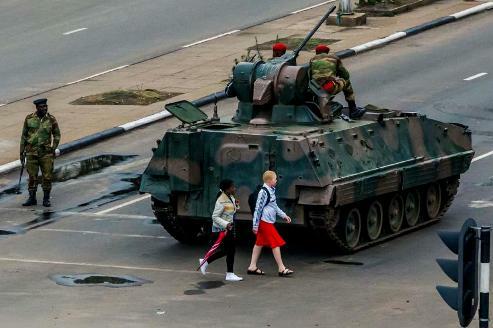 What is very evident is that Zimbabwe, like many African countries, is sitting poised for something else; for new identities, new myths, new stories and undoubtedly from this quiet revolution, new forms of artistic expression will transpire and spread. ....Talking about transformation, I was gathering info for my new webpage on Recycled/Upcycled art when all this occurred. 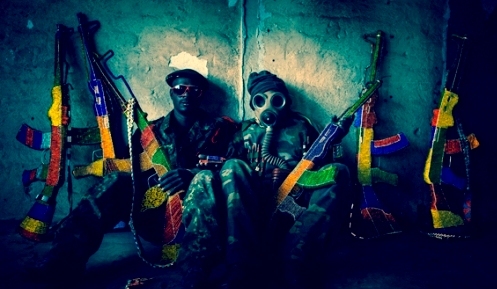 So I have decided to share with you some images of assembled art by African artists who have used recycled abandoned military ware to convey their messages to their viewers. Sometimes it’s just all about joy and celebration. It doesn’t always have to be about the horrors of war to catch the public's attention; art can be shown in an uplifting way to project the indomitable human spirit and to touch on our humanity. It can just be all about projecting hope. This is an incredibly beautiful piece of work by artist RALPH ZIMAN of South africa who conceptualized the project. Kennedy Mwashusha, one of the artists who worked on the Casspir Project, with the exhibit at Turbine Hall in downtown Joburg. The detail is extraordinary and the care taken is beyond normal. 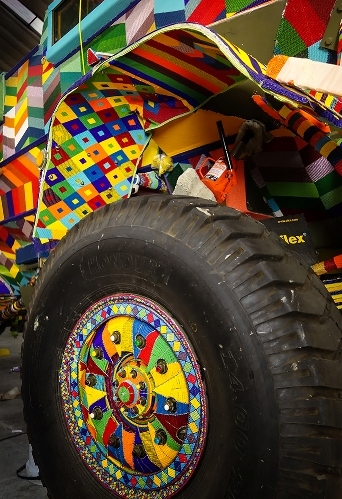 The project took over a year to complete and over 60 beading artists were involved in the crafting. 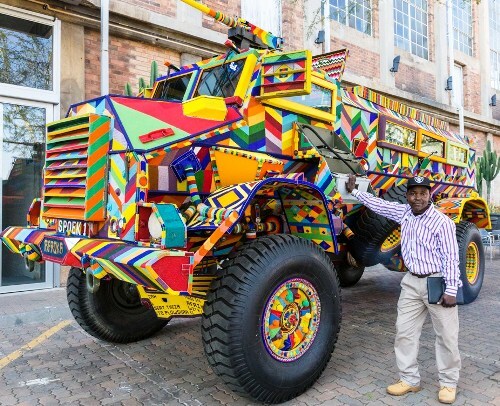 It is a symbolic piece of transformation as this armored car, known as a ‘Casspir’ would normally evoke feelings of terror and hatred, used as it was during apartheid years in South Africa. 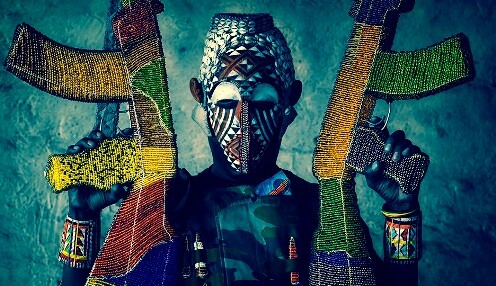 This same artist initiated a project which showed soldiers with beaded guns, bullets and other military hardware. The photographs were shot in a more brooding atmosphere and evoke feelings of latent violence. Despite the beautiful beading work, there is no doubt about the sinister motives of these ghostly revolutionaries. 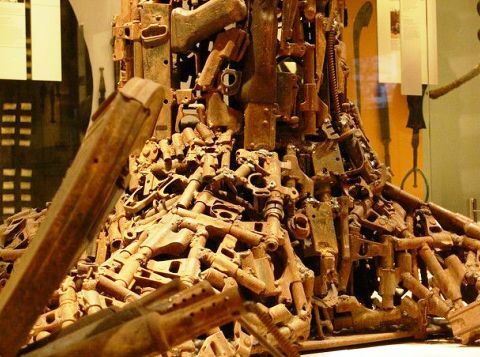 GONCALO MABUNDA is a Mozambican who has been making upcycled furniture and sculptures from guns and weaponry for quite a while now. 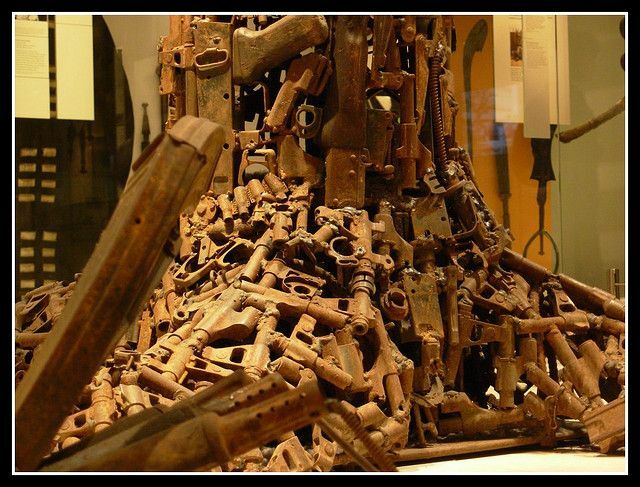 Using decommissioned weapons like deactivated rocket launchers, rifles and pistols,(each holding their own story from Mozambique’s 16 year long civil war), he welds together his ‘thrones’. 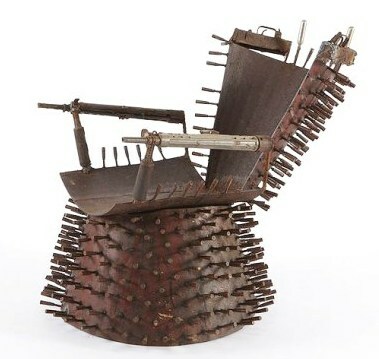 They are a testimony to both their tribal backgrounds (chief’s chairs) and to contemporary recycled African art. Artists in Mozambique under the direction of Mabunda took 3 months to complete the 3m tall sculpture. 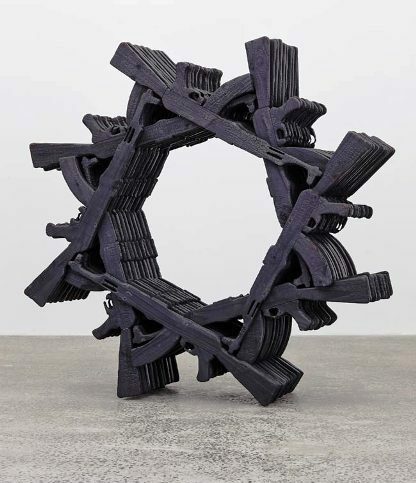 Sculptor MICHELE MATHISON (Zim/SA) uses simple objects and tools in repetitive ways to make his point like these guns fashioned from charred wood and paint. 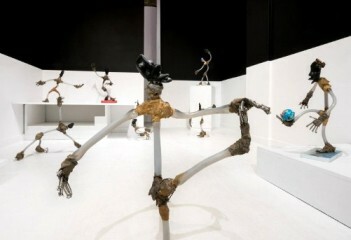 He creates a new structure, a new form but the significance of the original object is not lost in any way. LAEILA ADJOVI, born in 1982, she grew up in Gabon and South Africa. She went on to study in France, spend time in India and New Caledonia and now resides back in Africa in Dakar, Senegal.. truly a rising, roving star! Her journalistic, documentary work is complemented by her photographic imagery; sometimes realistic and representative and sometimes inventive.. but always artistically sensitive and, increasingly, evocative as she incorporates story telling into her work. 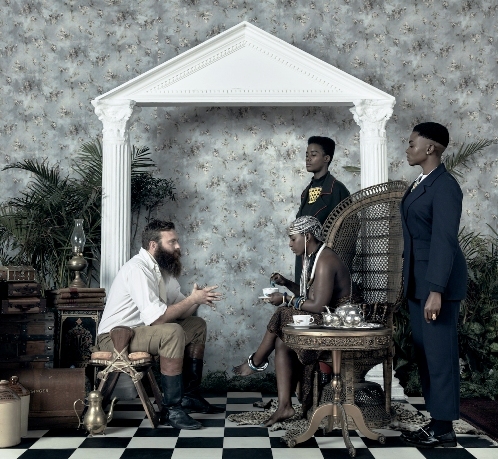 Her favourite themes relate to social issues and African cultural heritage. 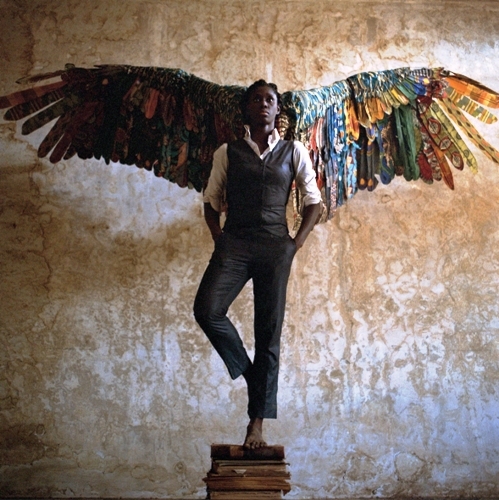 As part of AKAA UNDERGROUND, Adjovi presented her series of photographs entitled ‘Malaika Dotou Sankofa’… a female character who personifies the notion of ‘breaking free’. Translated as a strong angel who looks to the past to learn and then move forward. This young Zimbabwean artist is showing his mixed media sculptures which combine many disparate elements to make up a piece; plastic bottles, wire, stone, dirt, rubber, chains, glue, resin and complete ‘found’ objects like slingshots. Musekiwa starts with traditional sculpture fashioning a head or hands or some other anatomical feature from stone before combining them with his industrial or found pieces into new forms. 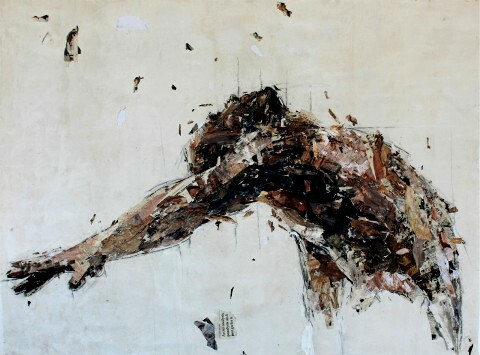 He has recently exhibited at the Tiroche deLeon Collection who has acquired a number of his pieces. Definitely a young man to watch. Kudzanai Chiurai is fast becoming an African icon; his social, religious and political art shifts our perspective on many things, making us renew our understanding of visual culture in Africa. In this exhibition as in most of his others, Chiurai brings together a number of ingredients; musicians, poets, writers, a radio station... as well as his own video, book, poster, journal, photographs, paintings... all combining to create not just an installation but an event. Based on a short story he has written, it is his intention to continue to challenge our fundamental beliefs and the primary foundation of our thinking and of our imagination. Basically he challenges us to invent new cosmologies, new myths, new stories... in this way he believes that only then will Africa correct and rewrite its post-colonial future into its own. Seven large-scale installations are shown, constructed as always out of recycled materials which are transformed to something else; (in this case thousands of crumpled pieces of metal from alcohol cans and bound together with copperwire). Shimmering tapestries that completely change the way one looks at trash. On a conceptual level in this exhibition the artist seeks to present a limitless horizon for Africa, poses different interpretations of everything and a possibility of anything being achievable. Born in 1944 in Ghana, El Anatsui has lived and worked in Nigeria since 1975. Hugely experimental and vigorous in his output, over the past 4 decades he has created a vast body of work. Truly revolutionary both in artistic practice and in concept it has expanded the language of contemporary African sculpture. Born and educated in Uganda he started to create in 2010. Facing financial challenges he turned to sourcing his art material from what he could find or didn’t have to pay for. Using garbage paper, magazines and general rubbish he began to tear up his waste and create collaged portraits of great complexity. He moved to South Africa after being awarded a residency and he has since remained in that country to work. In this current collection he has turned to half torsos. Underneath all the apparent surface frenzy of torn up bits, an acute understanding of anatomy and form is apparent, line drawing is faintly seen but without this, these collages would fall apart. I do hope you have enjoyed reading this seventh edition of CAA newsletter.